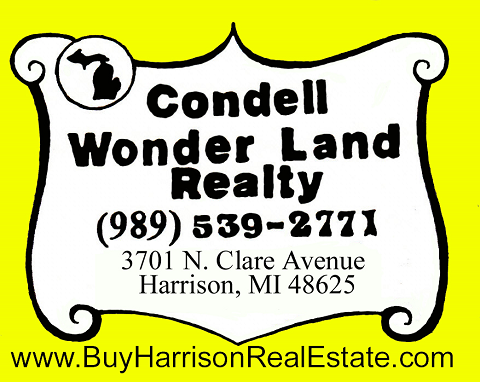 Condell Wonder Land Realty would like to provide you with information on Harrison MI. Business, Motels, Restaurants, Camping, Churches, Contractors, Local Government, and Much more. If you are a local resident or are considering moving here, you will find this page to be a valuable resource for information about high-quality local businesses in the area. Any questions contact us. If you are a local resident or are considering moving here, you will find this page to be a valuable resource for information about high-quality local businesses in the Harrison MI. area. Want to make that trip to Florida that the family has been asking for all year long? Finding affordable Hotels in Orlando is a must to keep the trip in budget. That's where Billy Boy's Travel comes to the rescue with fantastic rates on all Orlando accommodations. Billy Boy's Travel also has great discounts on attraction tickets and rental cars. Located in downtown Clare, the Doherty offers over 80 years of experience in hospitality. Available: fine dining restaurant, cocktail lounge, indoor pool and jacuzzi, business center, truck/trailer parking, refrigerators, fireplaces and free full breakfast midweek. Special packages available: golf, ski, romantic getaways, shopping, casino and spa. We are a SENIOR CITIZEN and LOW INCOME complex. HARRISON HOUSING INC., does not discriminate on the basis of handicapped status in the admission or access to, or treatment or employment in, its federally assisted programs and activities. Clare County's only AAA Diamond Rated waterfront motel... Enjoy our private sandy beach and five peaceful, shady acres with a spectacular view of Budd Lake right from your patio door. Family-oriented and friendly, the Lakeside's clean and comfortable motel rooms are open all year. Housekeeping cottages are open April through November. Whirlpool rooms, cable TV, in-room coffee & tea, free broadband WiFi. Smoking and non-smoking available. Pets welcome. Mike & Donna Romatz "Welcomes You!" Modern, attractively furnished two-, three-, and four-bedroom cottages on all-sports Budd Lake. Bedding, towels, and all kitchen amenities provided. Expansive sandy beach, private decks, gas grills and picnic tables on decks, play area, fire pit. Pontoon rentals to guests. The Nest cottage is wheelchair/scooter accessible. The Hideaway cottage has a private dock and sandy beach. Seasonal rates. VISA and MasterCard welcome. Sorry, no pets. 4930 E. Townline Lake Rd. Open Monday-Saturday 9-5pm. Used Cars & Parts, 24 Hour Wrecker Service. We buy Scrap Metal. Many classic Cars and parts on location. New store hours: Mon-Fri 9-5, Saturday 9-2pm. Brakes, exhaust, front-end alignments and oil changes. We offer fast friendly services in a professional atmosphere. We now service Water crafts, ATV's, and Snowmobiles. We also sell Water crafts, ATV's and Snowmobile accessories. S & S Collision Inc.
Tim Merritt Auto Repair Inc.
8580 E. Townline Lake Rd. Group Outings, Rallies, Shows, Camping with 95 Modern Sites, Large Indoor and Outdoor Exhibit Areas and Close to local attractions. Located just 8 miles North of Harrison on Old 27. 41 Wooded lots, Playground, Pull-thru sites, Electric sites, Dump Station and Walking Trails. 2246 E. Cranberry Lake Rd. 2770 Townline Lake Rd. & Wilson Rd. 3125 E. Long Lake Rd. Meeting address: 413 Coker St. Assisting in the planning, development and/or financing of local business. Over 30 years of service. The City Council of Harrison and the Harrison Chamber of Commerce are working together to assure the best of vacations for visitors. Our City Park System, along with Budd Lake, Little Long Lake, Wilson State Park and the Clare County Fair Grounds, all within the City limits, offer unique opportunities to residents and vacationers alike. Look no further, COME TO HARRISON, and enjoy! 5002 E. Townline Lake Rd. Servicing the Community for 22 years. A Family Oriented Fraternity. For members and qualified guests only. 2051 E. Townline Lake Rd. Bingo-Thursday 6:30 pm, Hall Rental for Weddings, Banquets and Parties. Located on the Clare County Fairgrounds. PO Box 236, 3241 Cranberry Lake Rd. Whatever your needs are, contact Mann Construction and let our well trained staff assist you in making your project a reality. Our knowledgeable personnel are prepared to work with you to get your building project going in the right direction from start to finish. Our business hours are Monday – Friday, 8:00 to 5:00 or evenings by appointment. Pole Building Sales & Construction. Steel Roofing, Cement for Pole Buildings, Driveways and Sidewalks. We combine the customer service you deserve with the financial products and services you need. Your local community bank and you, ITS PERFECT CHEMISTRY. "We think you'll like the chemistry!" Making your banking more convenient! Fri 8:30-6:00 and Sat. 9-12. For all your Insurance needs. Auto, Home, Life and Business. Natural Chiropractic Care--A Holistic Approach-- Dr. Joni M. Ashcroft, D.C.
"On the Muskegon River". Canoes, Rafts, Kayaks, Tubes, Modern and Rustic Camping. Hot showers, volleyball and camp store. Located 12 miles West of Harrison on M-61. Go Karts, Miniature Golf, Batting Cages, and Arcade Room. We have Snowboarding, Skiing and Tubing in the Winter and In the Summer come out to golf! outdoor Banquet facilities. Also, we have lots available in Tamarack Ridge Estates, two & three bedroom condos available in Tamarack Golf Villa. #1 Up North for the BEST Food, Drinks, Live Music, and Funnnnnnnn! Dine in/Take out--Quick and Fast! 10141 N. Finley Lake Rd. The Surrey House Restaurant & Saloon is Harrison’s oldest Historical Landmark. 2006 is the 125th anniversary of our building. We’re a full service restaurant with great food and spirits in downtown Harrison. 127th year in 2008 and great dining in a casual (jeans welcome) atmosphere. Special financing for low income individuals/those with credit worries. Business Hours: Monday-Friday 9am to 6 pm and Saturday 9am to 5pm. Service you can trust - for Over 60 years! Price Club, Cash & Quantity Discounts, Automatic Keep Full Service and Budget Plan. 24 hour Emergency Service. 6976 E. Townline Lake Rd. Stanley Fuel Gas & Oil Co. Inc.
3030 E. Long Lake Rd. 5527 E. Townline Lake Rd. Landscaping Mulch/Screened Black Dirt/Fill Sand/Gravel/Crushed Limestone/Washed Stone--No job too big or too small. William & Cody Beemer Serving the Harrison area since 1964.
and Quality Printing. For all your business needs since 1881. Clare County's leading news source since 1879. The Clare Sentinel & Sentinel Reminder reach more Clare County residents each month than any other newspaper. Dancer and Sons Well Drilling, Inc. Attorneys specializing in: Real Estate, Business Law, Family Law, Criminal Law, Personal Injury and Dog Bites. Your full service rental center. We can help you complete a home improvement project or plan a wedding reception, family reunion or graduation celebration. Stop in and let our friendly staff work with you to get your job done. We are also a Budget Truck Dealer and UPS Shipping Center. Over 20 years of experience! Residential, Commercial or Industrial. Check them out for all your excavating and concrete needs! Firovac vacuum tankers, Custom Fab, Simon & Precision, Fire Apparatus, Alum Line, Rescues Cet Skid Units, New & Used Ambulances and Remounting Ferno & Stryker Cots, Nike Hydraulic Rescue Tools, LED Warning Lights and Lt. Bars, Dual Tone Electronic Sirens, Am-soil Synthetic Oils, Transport Screens and Grill Guards. 6212 E. Townline Lake Rd. Monday thru Friday 9:00AM to 5:30PM and Saturday 9:00AM to 2:00PM and closed Sundays. 129 N. Second St., Harrison, Mi. General Practice Firm - Specializing in criminal defense and child protective proceedings. Website design, domain names, website hosting. Websites large & small. For budgets of all sizes. 513 N. County Farm Rd. 4215 E. Long Lake Rd. In business since 1976. We also have Cottage Decor, Gifts and Candles. Stacy S. Stocking Licensed Funeral Director-Manager. Providing individuals and businesses with Federal and State income tax preparation, Electronic filing, confidential Services, bookkeeping and payroll.